AT-rich interactive domain-containing protein 1A (ARID1A) is a member of the SWI/SNF family, which have helicase and ATPase activities and are thought to regulate transcription of certain genes by altering the chromatin structure around those genes. ARID1A is part of the large ATP-dependent chromatin remodeling complex SNF/SWI required for transcriptional activation of genes normally repressed by chromatin. It possesses at least two conserved domains that could be important for its function. First, it has a DNA-binding domain that can specifically bind an AT-rich DNA sequence known to be recognized by a SNF/SWI complex at the beta-globin locus. Second, the C-terminus of the protein can stimulate glucocorticoid receptor-dependent transcriptional activation. It is thought that ARID1A confers specificity to the SNF/SWI complex and may recruit the complex to its targets through either protein-DNA or protein-protein interactions. Two transcript variants encoding different isoforms have been found for ARID1A [provided by RefSeq]. Rabbit polyclonal antibodies were produced by immunizing animals with GST-fusion proteins containing either the N-terminal [ARID1A (N2) (R0436-2)] or the C-terminal [ARID1A (C) (R0436-3)] region of human ARID1A. Antibodies were purified by affinity purification using immunogen. Fig 1. (A) Western blot of total cell extracts from a. mouse thymus, b,c. 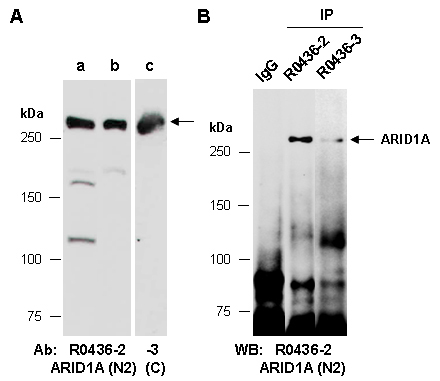 human Jurkat; using 2 independent Abs against 2 distinct regions of human ARID1A at RT for 2 h. (B) Total extracts from human Jurkat were immunoprecipitated (IP) with IgG or 2 independent Abs for ARID1A; followed by WB with ARID1A (N2) (R0436-2).